Vandry also discussed the FDA’s warning on NSAIDS, and the overuse of them. As she finished with a question and answer section, many in the audience discussed their own chronic pain, migraines, arthritis and other pain related conditions. Vandry’s addressing questions. Marcos Santos to the right. student Matt Brazille and Expo host Professor Marcos Santos of RCJ Machado academy Ft Worth. CM: I, before I came here I just wanted to mention I talked to one of my black belts, we are very health oriented. I have a Black belt called William Vandry, he’s among one of my first black belts and he is a great story in itself, an amazing man that has overcome incredible obstacles. 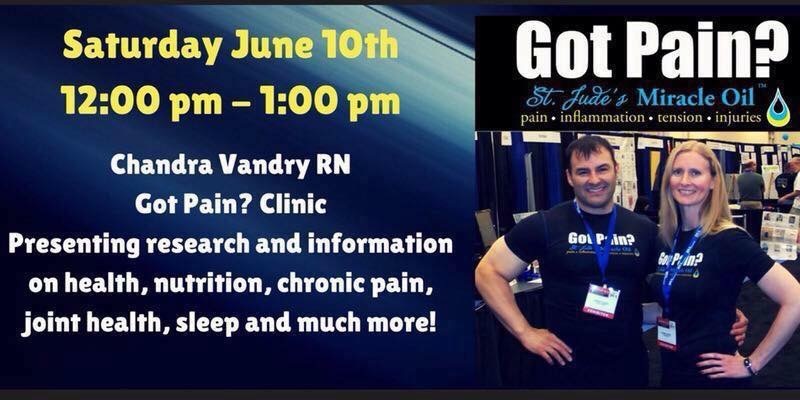 He created an oil called the St. Jude’s Miracle oilTM, and for us who do Jiu-jitsu that are always complaining about our joints, or people take cortisone shots, anti inflammatory things can be harmful to your health. This oil, if you go to their facebook page, just type St. Jude’s Miracle Oil. CM: Youre gonna find information, and I kid you not, when I send you my book, I am also gonna send a sample of that oil. CM: And your gonna tell me once you put that thing on any joint that aches, what is gonna happen afterwards. CK: You know that I could use that, that’s incredible because I ache all over..
Co-inventors of St. Jude’s Miracle oilTM will be discussing the effects of their Miracle Oil product. Discussion will be on nutrition, inflammation, degeneration of joints in society. A research team led by Carnegie Mellon University’s Sheldon Cohen has found that chronic psychological stress is associated with the body losing its ability to regulate the inflammatory response. Published in the Proceedings of the National Academy of Sciences, the research shows for the first time that the effects of psychological stress on the body’s ability to regulate inflammation can promote the development and progression of disease1. The main topic will be on the Miracle oil product, the references to studies on essential oils from medical journals. Research on essential oils is limited, and more funding would be appropriate. Below are medical journals from NCBI and PubMed medical journals specifically correlating essential oils effect on above viruses, strains, etc. Our research is comparing the oils specifically from St. Jude’s Miracle oilTM (peppermint, eucalyptus, lavender, geranium, clary sage, clove bud, myrrh, and frankincense and wintergreen) and effect on viruses, MDR, MSSA, MRSA, bacteria, staph and others. Mentha piperita, family Labiatae, is a herbaceous rhizomatous perennial plant widely used in Ayurveda . It contains about 1.2%–1.5% essential oil. The volatile oil, also known as menthae piperitae aetheroleum, contains 30–70% free menthol, menthol esters and more than 40 other compounds. The principal components of the oil are menthol (29%), menthone (20%–30%), and menthyl acetate (3%–10%). Pharmaceutical grade oil, produced by distilling the fresh aerial parts of the plant at the beginning of the flowering cycle, is standardized to contain no less than 44% menthol, 15%–30% menthone, and 5% esters, in addition to various terpenoids. Other compounds found in it are flavonoids (12%), polymerized polyphenols (19%), carotenes, tocopherols, betaine, and choline . The antimicrobial and antiviral activity of menthol has been reported. Mentha piperita has significant antiviral activity . Menthol is virucidal against influenza, herpes, and other viruses in vitro. Aqueous extracts of peppermint leaves exhibited antiviral activity against Influenza A, Newcastle disease virus, Herpes simplex virus, and Vaccinia virus in egg and cell-culture systems . The oil contains terpenoids such as α-pinene or β-pinene, α-phellandren, and also ester-connected with menthol or free acetic acid and isovaleric acid, which are mainly responsible for the antimicrobial activity of the herb . 78. Peirce A. The American Pharmaceutical Association Practical Guide to Natural Medicines. New York, NY, USA: William Morrow; 1999. 79. MurrayMT. The Healing Power of Herbs: The Enlightened Person’s Guide to the Wonders of Medicinal Plants. Vol. 25. Rocklin, Calif, USA: Prima; 1995. Pharm Biol. 2011 Sep;49(9):893-9. doi: 10.3109/13880209.2011.553625. Epub 2011 May 19. Mulyaningsih S1, Sporer F, Reichling J, Wink M.
1Institute of Pharmacy and Molecular Biotechnology, HeidelbergUniversity, Im Neuenheimer Feld, Heidelberg, Germany. CONTEXT: Eucalyptus globulus Labill (Myrtaceae) is the principal source of eucalyptus oil in the world and has been used as an antiseptic and for relieving symptoms of cough, cold, sore throat, and other infections. The oil, well known as ‘eucalyptus oil’ commercially, has been produced from the leaves. Biological properties of the essential oil of fruits from E. globulus have not been investigated much. OBJECTIVE: The present study was performed to examine the antimicrobial activity of the fruit oil of E. globulus (EGF) and the leaf oils of E. globulus (EGL), E. radiata Sieber ex DC (ERL) and E. citriodora Hook (ECL) against multidrug-resistant (MDR) bacteria. Furthermore, this study was attempted to characterize the oils as well as to establish a relationship between the chemical composition and the corresponding antimicrobial properties. MATERIALS AND METHODS: The chemical composition of the oils was analyzed by GLC-MS. The oils and isolated major components of the oils were tested against MDR bacteria using the broth microdilution method. RESULTS: EGF exerted the most pronounced activity against methicillin-resistant Staphylococcus aureus (MIC ~ 250 µg/ml). EGF mainly consisted of aromadendrene (31.17%), whereas ECL had citronellal (90.07%) and citronellol (4.32%) as the major compounds. 1,8-cineole was most abundant in EGL (86.51%) and ERL (82.66%). Roller S1, Ernest N, Buckle J. OBJECTIVE: The objective of this study was to compare the antimicrobial efficacy of several lavender oils, used singly and in combination, on methicillin-sensitive and methicillin-resistant Staphylococcus aureus (MSSA and MRSA). METHODS: Four chemically characterized essential oils from Lavandula angustifolia, L. latifolia, L. stoechas, and a necrodane-rich L. luisieri were assessed for their antibacterial activity using the disc diffusion method. RESULTS: All four lavender oils inhibited growth of both MSSA and MRSA by direct contact but not in the vapor phase. Inhibition zones ranged from 8 to 30 mm in diameter at oil doses ranging from 1 to 20 microL, respectively, demonstrating a dose response. At any single dose, the extent of inhibition was very similar irrespective of the chemical composition of the oils or the strain of S. aureus used. Several binary combinations of the oils were tested, and the results showed that the necrodane-rich L. luisieri oil interacted synergistically with L. stoechas (high in 1,8-cineole, fenchone, and camphor) and L. langustifolia (rich in linalool and linalyl acetate) to produce larger inhibition zones than those produced using each oil individually. CONCLUSIONS: The results suggest that combinations of lavender oils should be investigated further for possible use in antibacterial products. Edwards-Jones V1, Buck R, Shawcross SG, Dawson MM, Dunn K.
Patchouli, tea tree, geranium, lavender essential oils and Citricidal (grapefruit seed extract) were used singly and in combination to assess their anti-bacterial activity against three strains of Staphylococcus aureus: Oxford S. aureus NCTC 6571 (Oxford strain), Epidemic methicillin-resistant S. aureus (EMRSA 15) and MRSA (untypable). The individual essential oils, extracts and combinations were impregnated into filter paper discs and placed on the surface of agar plates, pre-seeded with the appropriate strain of Staphylococcus. The effects of the vapours of the oils and oil combinations were also assessed using impregnated filter paper discs that were placed on the underside of the Petri dish lid at a distance of 8mm from the bacteria. The most inhibitory combinations of oils for each strain were used in a dressing model constructed using a four layers of dressings: the primary layer consisted of either Jelonet or TelfaClear with or without Flamazine; the second was a layer of gauze, the third a layer of Gamgee and the final layer was Crepe bandage. The oil combinations were placed in either the gauze or the Gamgee layer. This four-layered dressing was placed over the seeded agar plate, incubated for 24h at 37 degrees C and the zones of inhibition measured. All experiments were repeated on three separate occasions. No anti-bacterial effects were observed when Flamazine was smeared on the gauze in the dressing model. When Telfaclear was used as the primary layer in the dressing model compared to Jelonet, greater zones of inhibition were observed. A combination of Citricidal and geranium oil showed the greatest-anti-bacterial effects against MRSA, whilst a combination of geranium and tea tree oil was most active against the methicillin-sensitive S. aureus (Oxford strain). This study demonstrates the potential of essential oils and essential oil vapors as antibacterial agents and for use in the treatment of MRSA infection. 2010 Feb;17(2):142-5. doi: 10.1016/j.phymed.2009.05.007. Epub 2009 Jul 2. Antibacterial effect of essential oils from two medicinal plants against Methicillin-resistant Staphylococcus aureus (MRSA). Tohidpour A1, Sattari M, Omidbaigi R, Yadegar A, Nazemi J. 1Department of Bacteriology, School of Medical Sciences, TarbiatModaresUniversity, P.O. Box: 14115-158, Tehran, Iran. Antimicrobial properties of plants essential oils (EOs) have been investigated through several observations and clinical studies which purpose them as potential tools to overcome the microbial drug resistance problem. The aim of this research is to study the antibacterial effect of two traditional plants essential oils, Thymus vulgaris and Eucalyptus globulus against clinical isolates of Methicillin resistant Staphylococcus aureus (MRSA) and other standard bacterial strains through disk diffusion and agar dilution methods. Gas Chromatography (GC) and Gas Chromatography/Mass Spectrometry (GC/MS) analysis examined the chemical composition of the oils. Results revealed both of oils to possess degrees of antibacterial activity against Gram (+) and Gram (-) bacteria. T. vulgaris EO showed better inhibitory effects than E. globulus essential oil. GC analysis of T. vulgaris resulted in thymol as the oil major compound whereas GC/MS assay exhibited eucalyptol as the most abundant constitute of E. globulus EO. These results support previous studies on these oils and suggest an additional option to treat MRSA infections. Clinical and further analytical trials of these data are necessary to confirm the obtained outcomes. Copyright 2009. Published by Elsevier GmbH. Nat Prod Res. 2014 Aug 30:1-4. Chemical composition and antibacterial activity of Lavandula coronopifolia essential oil against antibiotic-resistant bacteria. Ait Said L1, Zahlane K, Ghalbane I, El Messoussi S, Romane A, Cavaleiro C, Salgueiro L.
1a Laboratory of Molecular and Ecophysiology Modeling, Faculty of Sciences-Semlalia , CadiAyyadUniversity , Marrakech , Morocco. The aim of this study was to analyse the composition of the essential oil (EO) of Lavandula coronopifolia from Morocco and to evaluate its in vitro antibacterial activity against antibiotic-resistant bacteria isolated from clinicalinfections. The antimicrobial activity was assessed by a broth micro-well dilution method using multiresistant clinical isolates of 11 pathogenic bacteria: Klebsiella pneumoniae subsp. pneumoniae, Klebsiella ornithinolytica, Escherichia coli, Enterobacter cloacae, Enterobacter aerogenes, Providencia rettgeri, Citrobacter freundii, Hafnia alvei, Salmonella spp., Acinetobacter baumannii and methicillin-resistant Staphylococcus aureus. The main compounds of the oil were carvacrol (48.9%), E-caryophyllene (10.8%) and caryophyllene oxide (7.7%). The oil showed activity against all tested strains with minimal inhibitory concentration (MIC) values ranging between 1% and 4%. For most of the strains, the MIC value was equivalent to the minimal bactericidal concentration value, indicating a clear bactericidal effect of L. coronopifolia EO. Nat Prod Commun. 2012 Oct;7(10):1401-4. Antimicrobial activity of blended essential oil preparation. Tadtong S1, Suppawat S, Tintawee A, Saramas P, Jareonvong S, Hongratanaworakit T.
Antimicrobial activities of two blended essential oil preparations comprising lavender oil, petigrain oil, clary sage oil, ylang ylang oil and jasmine oil were evaluated against various pathogenic microorganisms. Both preparations showed antimicrobial activity in the agar disc diffusion assay against the Gram-positive bacteria, Staphylococcus aureus ATCC6538 and S. epidermidis isolated strain, the fungus, Candida albicans ATCC10231, and the Gram-negative bacterium, Escherichia coli ATCC25922, but showed no activity against Pseudomonas aeruginosa ATCC9027. The minimum inhibitory concentration (MIC) of these preparations was evaluated. By the broth microdilution assay, preparation 1, comprising lavender oil, clary sage oil, and ylang ylang oil (volume ratio 3:4:3), exhibited stronger antimicrobial activity than preparation 2, which was composed of petigrain oil, clary sage oil, and jasmine oil (volume ratio 3:4:3). Moreover, the sum of the fractional inhibitory concentrations (Sigma fic) of preparation 1 expressed a synergistic antimicrobial effect against the tested microorganisms (Sigma fic<l). The blended essential oil preparations, characterized for their components by GC/MS, contained linalyl acetate, and linalool as major components. Our experiments showed that the differential antimicrobial effect of either blended oil preparations or single/pure essential oils may be influenced by the amount of linalool and linalyl acetate, and the number of active components in either the blended preparations or single/pure essential oils. In addition, blended oil preparations expressed synergistic antimicrobial effect by the accumulation of active components such as linalool and linalyl acetate and combining active constituents of more than one oil. Molecules. 2012 Aug 28;17(9):10276-91. doi: 10.3390/molecules170910276. Antimicrobial activity of geranium oil against clinical strains of Staphylococcus aureus. Bigos M1, Wasiela M, Kalemba D, Sienkiewicz M.
J Craniomaxillofac Surg. 2009 Oct;37(7):392-7. doi: 10.1016/j.jcms.2009.03.017. Epub 2009 May 26. Warnke PH1, Becker ST, Podschun R, Sivananthan S, Springer IN, Russo PA, Wiltfang J, Fickenscher H, Sherry E.
Anti-biofilm, anti-hemolysis, and anti-virulence activities of black pepper, cananga, myrrh oils, and nerolidol against Staphylococcus aureus. Lee K1, Lee JH, Kim SI, Cho MH, Lee J. 1School of Chemical Engineering, YeungnamUniversity, Gyeongsan, 712-749, Republic of Korea. The long-term usage of antibiotics has resulted in the evolution of multidrug-resistant bacteria. Unlike antibiotics, anti-virulence approaches target bacterial virulence without affecting cell viability, which may be less prone to develop drug resistance. Staphylococcus aureus is a major human pathogen that produces diverse virulence factors, such as α-toxin, which is hemolytic. Also, biofilm formation of S. aureus is one of the mechanisms of its drug resistance. In this study, anti-biofilm screening of 83 essential oils showed that black pepper, cananga, and myrrh oils and their common constituent cis-nerolidol at 0.01 % markedly inhibited S. aureus biofilm formation. Furthermore, the three essential oils and cis-nerolidol at below 0.005 % almost abolished the hemolytic activity of S. aureus. Transcriptional analyses showed that black pepper oil down-regulated the expressions of the α-toxin gene (hla), the nuclease genes, and the regulatory genes. In addition, black pepper, cananga, and myrrh oils and cis-nerolidol attenuated S. aureus virulence in the nematode Caenorhabditis elegans. This study is one of the most extensive on anti-virulence screening using diverse essential oils and provides comprehensive data on the subject. This finding implies other beneficial effects of essential oils and suggests that black pepper, cananga, and myrrh oils have potential use as anti-virulence strategies against persistent S. aureus infections. Dolara P, Corte B, Ghelardini C, Pugliese AM, Cerbai E, Menichetti S, Lo Nostro A.
BMC Microbiol. 2011 Mar 16;11:54. doi: 10.1186/1471-2180-11-54. Antistaphylococcal and biofilm inhibitory activities of acetyl-11-keto-β-boswellic acid from Boswellia serrata. Raja AF1, Ali F, Khan IA, Shawl AS, Arora DS, Shah BA, Taneja SC. 1Microbiology Unit, Indian Institute of Integrative Medicine (CSIR), Sanatnagar, Srinagar, 190005, India. BACKGROUND: Boswellic acids are pentacyclic triterpenes, which are produced in plants belonging to the genus Boswellia. Boswellic acids appear in the resin exudates of the plant and it makes up 25-35% of the resin. β-boswellic acid, 11-keto-β-boswellic acid and acetyl-11-keto-β-boswellic acid have been implicated in apoptosis of cancer cells, particularly that of brain tumors and cells affected by leukemia or colon cancer. These molecules are also associated with potent antimicrobial activities. The present study describes the antimicrobial activities of boswellic acid molecules against 112 pathogenic bacterial isolates including ATCC strains. Acetyl-11-keto-β-boswellic acid (AKBA), which exhibited the most potent antibacterial activity, was further evaluated in time kill studies, postantibiotic effect (PAE) and biofilm susceptibility assay. The mechanism of action of AKBA was investigated by propidium iodide uptake, leakage of 260 and 280 nm absorbing material assays. RESULTS: AKBA was found to be the most active compound showing an MIC range of 2-8 μg/ml against the entire gram positive bacterial pathogens tested. It exhibited concentration dependent killing of Staphylococcus aureus ATCC 29213 up to 8 × MIC and also demonstrated postantibiotic effect (PAE) of 4.8 h at 2 × MIC. Furthermore, AKBA inhibited the formation of biofilms generated by S. aureus and Staphylococcus epidermidis and also reduced the preformed biofilms by these bacteria. Increased uptake of propidium iodide and leakage of 260 and 280 nm absorbing material by AKBA treated cells of S aureus indicating that the antibacterial mode of action of AKBA probably occurred via disruption of microbial membrane structure. CONCLUSIONS: This study supported the potential use of AKBA in treating S. aureus infections. AKBA can be further exploited to evolve potential lead compounds in the discovery of new anti-Gram-positive and anti-biofilm agents. Information within this site is for educational purposes only. The U.S. Food & Drug Administration has not evaluated statements about the product efficacy. These products are not intended to diagnose, treat, cure, or prevent any disease. Consult your physician before using for advice. 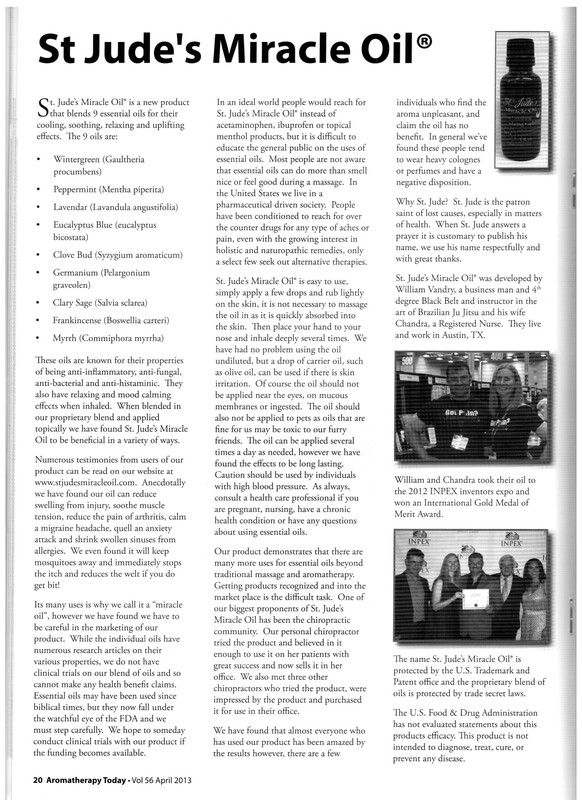 Nicknamed Vandry oil, or Miracle oil, St. Jude’s Miracle oilTM has been a positive product. Although a goal for a top medical study would be a goal, there are medical studies on essential oils. The funding for more research is what is needed. Essential oils have been researched for pain, inflammation, stress, anxiety and 101 other studies. Although those goals are a use of essential oils, wound healing is also in the NCBI and PubMed medical journals relating to essential oils. When we researched the oils in our product, we found positive studies on wounds, inflammation, infection and related uses. Abrasion injuries most commonly occur when exposed skin comes into moving contact with a rough surface, causing a grinding or rubbing away of the upper layers of the epidermis. 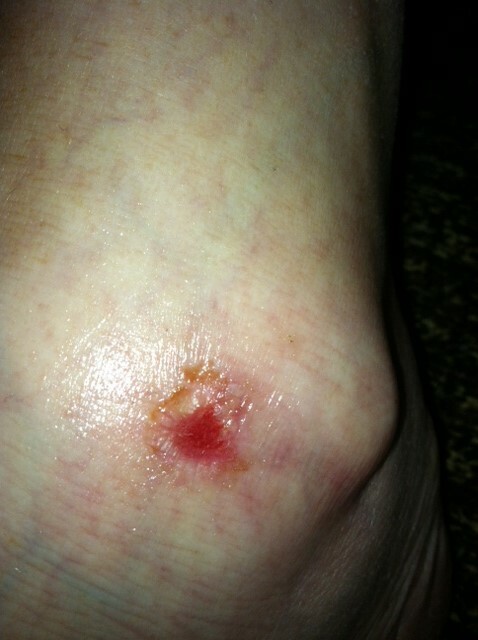 This deep abrasion on the ankle did not initially heal. These photos show a wound that was observed, and Miracle oil was applied around wound, and photos are from a 32 hour timeline. Third photo shows impressive wound comparison and was taken 7/8/2014 at 7:55pm. 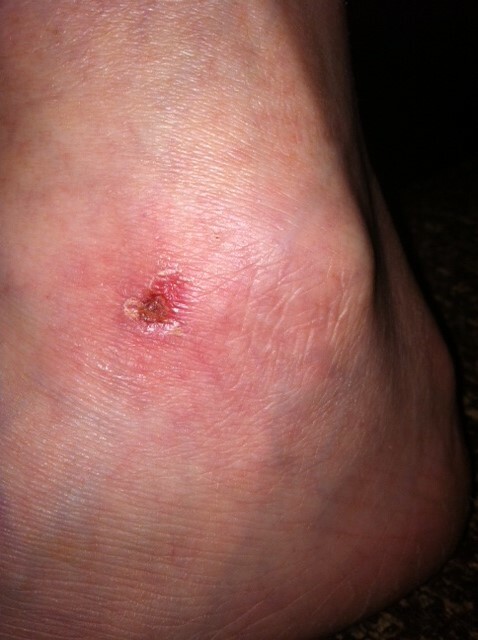 As seen for anecdotal comparison, a similar wound photos on the Before and After page display over two weeks recovery time of natural healing. Although our studies are anecdotal on the wound, they are still impressive. Studies give hope on Myrrh, Frankincense, Lavender, Peppermint, Eucalyptus, Geranium for future research on wound healing, sealing, infections and wound management. 6 out of the 9 St. Jude’s Miracle oilTM product show in studies, and all 9 oils work on inflammation, infection and other additions to wound healing needs. Wintergreen acts as an anti-inflammatory agent (9). inflammatory, and antimicrobial, among others (10), inflammatory and analgesic properties (11), and pain relief assessment (12), inflammatory and analgesic properties (13), anti fungal effects (14). Geranium has shown temporary relief of neuralgia pain (15). Clary Sage in pain relief on outpatients with primary dysmenorrhea (16). More funded studies would be needed. Methyl salicylate 2-O-β-D-lactoside, a novel salicylic acid analogue, acts as an anti-inflammatory agent on microglia and astrocytes.Lan X, Liu R, Sun L, Zhang T, Du G.J Neuroinflammation. 2011 Aug 11;8:98. doi: 10.1186/1742-2094-8-98. 9. A novel naturally occurring salicylic acid analogue acts as an anti-inflammatory agent by inhibiting nuclear factor-kappaB activity in RAW264.7 macrophages. Zhang T, Sun L, Liu R, Zhang D, Lan X, Huang C, Xin W, Wang C, Zhang D, Du G.Mol Pharm. 2012 Mar 5;9(3):671-7. doi: 10.1021/mp2003779. Epub 2012 Feb 15. 11. Evaluation of the new anti-inflammatory compound ethyl salicylate 2-O-β-d-glucoside and its possible mechanism of action. Xin W, Huang C, Zhang X, Zhang G, Ma X, Sun L, Wang C, Zhang D, Zhang T, Du G.Int Immunopharmacol. 2012 Dec 4;15(2):303-308. doi:10.1016/j.intimp.2012.11.014. 12. Mullally BH, James JA, Coulter WA, Linden GJ. The efficacy of a herbal-based toothpaste on the control of plaque and gingivitis. J Clin Periodontol. 1995;22(9):686–9. 15. Phytochemical composition of Cymbopogon citratus and Eucalyptus citriodora essential oils and their anti-inflammatory and analgesic properties on Wistar rats. Gbenou JD, Ahounou JF, Akakpo HB, Laleye A, Yayi E, Gbaguidi F, Baba-Moussa L, Darboux R, Dansou P, Moudachirou M, Kotchoni SO. SourceLaboratoire de Pharmacognosie et des Huiles Essentielles, Faculté des Sciences de la Santé, Faculté des Sciences et Techniques, Université d’Abomey Calavi, 01 BP 918, Cotonou, Benin. 17. Curr Med Chem. 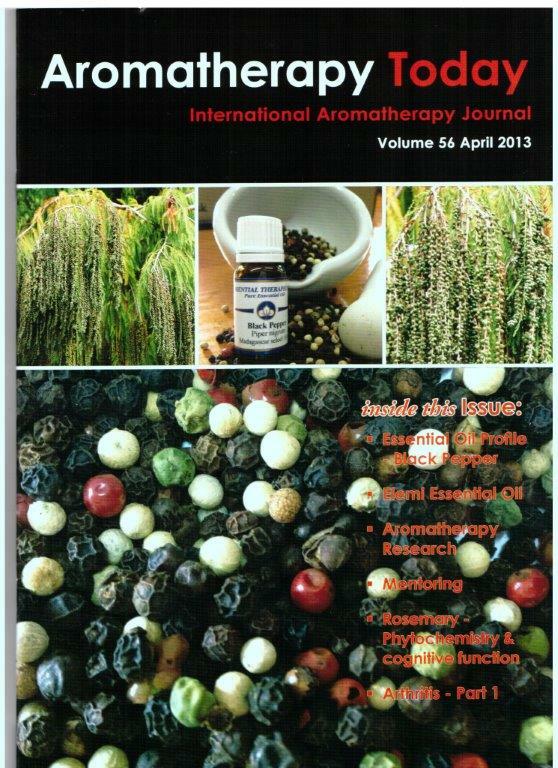 2003 May;10(10):813-29.Antibacterial and antifungal properties of essential oils. Kalemba D, Kunicka A.SourceInstitute of General Food Chemistry, Technical University of Lodz, Poland. 18. 20Greenway, f, Frome & Engels, T. (2003). Temporary relief of postherpetic neuralgia pain with topical geranium oil. American J of Medicine, 115, 586-587. 21. Anti-inflammatory and analgesic activity of different extracts of Commiphora myrrha. Source: Jiangsu Key Laboratory for TCM Formulae Research, Nanjing University of Chinese Medicine, Nanjing 210046, PR China. Can oils in St. Jude’s Miracle oil repel mosquitoes? I wanted to dig in a little more, and found more pubmed (ncbi) studies that has more discussion on oils with mosquitoes. Again we find three out of five oils used in this anti repellent clinical are oils we use in our product (geranium, clove, peppermint, the other two used in this trial were cedarwood and thyme) (2). Mosquito repellent inventions show 1/3 are using essential oils. In this pubmed article, the main oils used for inventions were: Camphor [Cinnamomum camphora (L.) J. Presl], cinnamon (Cinnamomum zeylanicum Blume), clove [Syzygium aromaticum (L.) Merr. & L.M. Perry], geranium (Pelargonium graveolens LʼHér. ), lavender (Lavandula angustifolia Mill. ), lemon [Citrus × limon (L.) Osbeck], lemongrass [Cymbopogon citratus (DC.) Stapf] and peppermint (Mentha × piperita L.) Here again it shows a consistency with the oils in our product for the repellent affect. Half of the oils used are Clove, Lavender, Peppermint and Geranium(3). To show a more direct effect on our oils, peppermint essential oil is proved to be efficient larvicide (4). Eucalyptus, geranium, and lavender together without any other oils in this study are a very effective mosquito repellent(5). Frankincense(6) and Myrrh(7) are lethal to larvae of mosquitos. Perhaps a diluted SJMO with water or oil to rub or spray may repel mosquitos! We would love to do more studies on mosquito bites and our oil. In the picture section of this website, it does show how the SJMO reduces mosquito bites within a short time. 1. Phytother Res. 2005 Apr;19(4):303-9. Comparative repellency of 38 essential oils against mosquito bites. Trongtokit Y, Rongsriyam Y, Komalamisra N, Apiwathnasorn C.
2. J Med Entomol. 1999 Sep;36(5):625-9. Repellency of essential oils to mosquitoes (Diptera: Culicidae). Center for Medical, Agricultural, and Veterinary Entomology, USDA-ARS, Gainesville, FL 32604, USA. The repellency of different concentrations (5, 10, 25, 50, 75, and 100%) and combinations of 5 essential oils (Bourbon geranium, cedarwood, clove, peppermint, and thyme) to Aedes aegypti (L.) and Anopheles albimanus Wiedemann when applied to human skin was determined in laboratory tests. Cedarwood oil failed to repel mosquitoes and only high concentrations of peppermint oil repelled Ae. aegypti. None of the oils tested prevented mosquito bite when used at the 5 or 10% concentration. Thyme and clove oils were the most effective mosquito repellents and provided 1 1/2 to 3 1/2 h of protection, depending on oil concentration. Clove oil (50%) combined with geranium oil (50%) or with thyme oil (50%) prevented biting by An. albimanus for 1 1/4 to 2 1/2 h. The potential for using essential oils as topical mosquito repellents may be limited by user acceptability; clove, thyme, and peppermint oils can be irritating to the skin, whereas both human subjects in this study judged the odor of clove and thyme oils unacceptable at concentrations > or = 25%. 3. Planta Med. 2011 Apr;77(6):598-617. doi: 10.1055/s-0030-1270723. Epub 2011 Feb 15. Patent literature on mosquito repellent inventions which contain plant essential oils–a review. Natural Products Department, National Institute for Amazon Research, Manaus, Brazil. Bites Bites of mosquitoes belonging to the genera Anopheles Meigen, Aedes Meigen, Culex L. and Haemagogus L. are a general nuisance and are responsible for the transmission of important tropical diseases such as malaria, hemorrhagic dengue and yellow fevers and filariasis (elephantiasis). Plants are traditional sources of mosquito repelling essential oils (EOs), glyceridic oils and repellent and synergistic chemicals. A Chemical Abstracts search on mosquito repellent inventions containing plant-derived EOs revealed 144 active patents mostly from Asia. Chinese, Japanese and Korean language patents and those of India (in English) accounted for roughly 3/4 of all patents. Since 1998 patents on EO-containing mosquito repellent inventions have almost doubled about every 4 years. In general, these patents describe repellent compositions for use in topical agents, cosmetic products, incense, fumigants, indoor and outdoor sprays, fibers, textiles among other applications. 67 EOs and 9 glyceridic oils were individually cited in at least 2 patents. Over 1/2 of all patents named just one EO. Citronella [Cymbopogon nardus (L.) Rendle, C.winterianus Jowitt ex Bor] and eucalyptus (Eucalyptus LʼHér. spp.) EOs were each cited in approximately 1/3 of all patents. Camphor [Cinnamomum camphora (L.) J. Presl], cinnamon (Cinnamomum zeylanicum Blume), clove [Syzygium aromaticum (L.) Merr. & L.M. Perry], geranium (Pelargonium graveolens LʼHér. ), lavender (Lavandula angustifolia Mill. ), lemon [Citrus × limon (L.) Osbeck], lemongrass [Cymbopogon citratus (DC.) Stapf] and peppermint (Mentha × piperita L.) EOs were each cited in > 10% of patents. Repellent chemicals present in EO compositions or added as pure “natural” ingredients such as geraniol, limonene, p-menthane-3,8-diol, nepetalactone and vanillin were described in approximately 40% of all patents. About 25% of EO-containing inventions included or were made to be used with synthetic insect control agents having mosquito repellent properties such as pyrethroids, N,N-diethyl-m-toluamide (DEET), (±)-p-menthane-3,8-diol (PMD) and dialkyl phthalates. Synergistic effects involving one or more EOs and synthetic and/or natural components were claimed in about 10% of all patents. Scientific literature sources provide evidence for the mosquito repellency of many of the EOs and individual chemical components found in EOs used in patented repellent inventions.© Georg Thieme Verlag KG Stuttgart · New York. 4. Asian Pac J Trop Biomed. 2011 Apr;1(2):85-8. doi: 10.1016/S2221-1691(11)60001-4.Bioefficacy of Mentha piperita essential oil against dengue fever mosquito Aedes aegypti L.Kumar S, Wahab N, Warikoo R.
Department of Zoology, Acharya Narendra Dev College (University of Delhi), New Delhi-110019, India. To assess the larvicidal and repellent potential of the essential oil extracted from the leaves of peppermint plant, Mentha piperita (M. piperita) against the larval and adult stages of Aedes aegypti (Ae. Aegypti). The larvicidal potential of peppermint oil was evaluated against early fourth instar larvae of Ae. 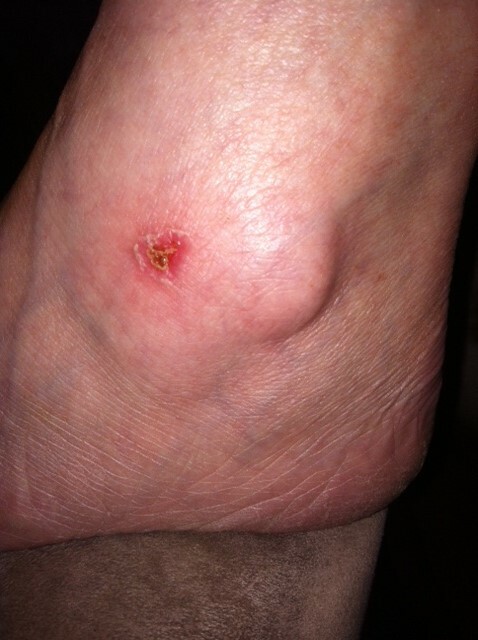 aegypti using WHO protocol. The mortality counts were made after 24 and 48 h, and LC50 and LC90 values were calculated. The efficacy of peppermint oil as mosquito repellent was assessed using the human-bait technique. The measured area of one arm of a human volunteer was applied with the oil and the other arm was applied with ethanol. The mosquito bites on both the arms were recorded for 3 min after every 15 min. The experiment continued for 3 h and the percent protection was calculated. The essential oil extracted from M. piperita possessed excellent larvicidal efficiency against dengue vector. The bioassays showed an LC50 and LC90 value of 111.9 and 295.18 ppm, respectively after 24 h of exposure. The toxicity of the oil increased 11.8% when the larvae were exposed to the oil for 48 h. The remarkable repellent properties of M. piperita essential oil were established against adults Ae. aegypti. The application of oil resulted in 100% protection till 150 min. After next 30 min, only 1-2 bites were recorded as compared with 8-9 bites on the control arm. The peppermint essential oil is proved to be efficient larvicide and repellent against dengue vector. Further studies are needed to identify the possible role of oil as adulticide, oviposition deterrent and ovicidal agent. The isolation of active ingredient from the oil could help in formulating strategies for mosquito control. 5. J Med Entomol. 2006 Jul;43(4):731-6. Repellency of oils of lemon eucalyptus, geranium, and lavender and the mosquito repellent MyggA natural to Ixodes ricinus (Acari: Ixodidae) in the laboratory and field. Jaenson TG, Garboui S, Palsson K.
Medical Entomology Unit, Department of Systematic Zoology, Evolutionary Biology Centre, Uppsala University, Norbyvägen 18d, SE-752 36 Uppsala, Sweden. MyggA Natural (Bioglan, Lund, Sweden) is a commercially available repellent against blood-feeding arthropods. It contains 30% of lemon-scented eucalyptus, Corymbia citriodora (Hook.) K. D. Hill & L. A. S. Johnson (Myrtaceae), oil with a minimum of 50% p-menthane-3,8-diol. MyggA Natural also contains small amounts of the essential oils of lavender, Lavandula angustifolia Mill. (Lamiaceae), and geranium, Pelargonium graveolens L’Her. (Geraniaceae). In laboratory bioassays, MyggA Natural and C. citriodora oil exhibited 100% repellency against host-seeking nymphs of Ixodes ricinus (L.) (Acari: Ixodidae). Lavender oil and geranium oil, when diluted to 1% in 1,2-propanediol, had weak repellent activities on I. ricinus nymphs, but when diluted to 30% in 1,2-propanediol had 100% repellencies. 1,2-Propanediol (100%) had no significant repellent activity in comparison with that of the control. In field tests in tick-infested areas in central Sweden, tick repellency of MyggA Natural and C. citriodora oil was tested by the blanket-dragging technique for 4 d during a 6-d period. The repellencies (74 and 85%, respectively) on day 1 are similar (89%) to that of blankets treated in a similar manner with 19% diethyl-methyl-benzamide, based on previous work. Repellencies declined significantly from day 1 to day 6 (74 to 45% for MyggA Natural; 85 to 42% for C. citriodora oil). 6.Parasitol Res. 2006 Sep;99(4):473-7. Epub 2006 Apr 27. Persistency of larvicidal effects of plant oil extracts under different storage conditions. The persistency of larvicidal effects of 13 oils (camphor, thyme, amyris, lemon, cedarwood, frankincense, dill, myrtle, juniper, black pepper, verbena, helichrysum, and sandalwood) was examined by storage of 50-ppm solutions under different conditions (open, closed, in the light, and in the dark) for 1 month after the preparation of the solutions. The stored solutions were tested against Aedes aegypti larvae for four times during the storage period. Some oils under some conditions stayed effective until the last test, while some solutions had lost their toxicity during a short time after preparation. Thus, the mode of storage is absolutely important for the larvicidal effects. The fresh preparations were always the best. 7. J Egypt Soc Parasitol. 2000 Apr;30(1):101-15. Larvicidal activity of Commiphora molmol against Culex pipiens and Aedes caspius larvae.Massoud AM, Labib IM. Department of Tropical Medicine, Faculty of Medicine, El-Azhar University, Cairo, Egypt. Myrrh (oleo-gum-resin) obtained from the stem of Commiphora molmol proved to have insecticidal activity against mosquito larvae. The oil extract of Myrrh possesses median lethal activity against 2nd, 3rd and 4th instar larvae of Culex pipiens at 0.016 x 10(2), 0.17 x 10(2) & 1.6 x 10(2) g/l respectively. While LC50 against 3rd instar larvae of Aedes caspius was 0.2 x 10(2) g/l. The oleo-resin extract showed toxicity against 2nd, 3rd, 4th instar larvae of C. pipiens recording the LC50 values of 0.06 x 10(2), 0.09 x 10(2) & 0.5 x 10(2) g/l respectively. While LC50 against 3rd instar larvae of A. caspius was 0.08 x 10(2) g/l. This plant extract has no marked toxic effect against the water bug Sphaerodema urinator (Dufor) and the water beetle Hydaticus leander (Rossi). Histological examinations of Myrrh treated mosquito larvae showed great pathological effect on their fat, muscles, gut and nervous tissues. 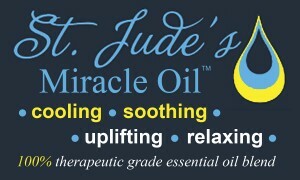 The St. Jude’s Miracle oil blend of 9 essential oils product will market the oil at the Christmas EXPO. SJMO will have a booth open for vendors to purchase the oil product for Christmas gifts or personal use. William and Chandra Vandry, the inventors will be available for all questions on the product. 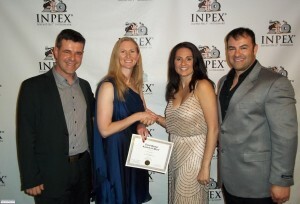 Texas inventors become International INPEX award winners, win International Gold Medal Award of Merit for St Jude’s Miracle Oil™. , an invention of aromatherapy massage oil and inhalant from a trademarked secret essential oil blend. June 13-15, 2012 – Husband and wife inventors William and Chandra Vandry from Austin, Texas competed in the largest international Inventor’s Expo in the world. Every invention and new product at INPEX is eligible to participate in the INPEX International Invention Awards Program. Over 600 inventions competed for awards from the USA and International competitors. An international jury judges entries, with winners determined on the basis of usefulness, creativity and overall appeal. Winning an INPEX invention award adds credibility to inventors on an international level. Operated by InventHelp, The Invention & New Product Exposition (INPEX) is a unique trade show that showcases numerous inventions, new products and innovations that are available to license, market or manufacture. “The Invention Show” brings inventors and entrepreneurs together with industry representatives in one convenient forum. William Vandry is an Instructor and owns a training academy of martial arts in Austin,Texas specializing in Brazilian Jiu-jitsu, a popular martial art seen in the Mixed Martial Arts sporting events such as the UFC (Ultimate Fighting Championship). (www.austinbjj.com and www.williamvandry.com). His wife Chandra is an RN in Allergy and Immunology. The Vandry’s invention was an International INPEX award winner, and won the coveted Gold Medal Award of Merit for the invention called St Jude’s Miracle Oil™. The oil is an aromatherapy massage oil. Keynote speaker for INPEX was Kevin Harrington, an investor seen on ABC’s Shark Tank TV show, and chairman of AsSeenOnTV.com. The Vandry’s were able to meet with Harrington for a quick review of the St Jude’s Miracle Oil™. Harrington stated that he did hear of the product, and he and his two co- judges sampled the oil, and within 2 minutes acknowledged its cool, soothing effect. In a 3-minute meeting called ‘Pitch Tank’, Harrington gives selected inventors three minutes to pitch their product, and receive comments and advice to inventors. Jeff Meltzer, Electronic Retailing Association Board Director and Direct TV judge on the Pitch session, similar to the Pitch tank session with Kevin Harrington, listened with five judges of INPEX to the Vandry’s pitch on the St Jude’s Miracle Oil™. Each judge sampled the oil for tension. Within two minutes, each of the five judges stated the product did work. Mr. Meltzer is a regular in the direct response industry and college lecture circuit. He was featured in the CNBC Special, “As Seen on TV” and is a frequent contributor and quoted expert in the Industry’s trade newspaper and magazines. Currently, Jeff is an Executive Board Member and Board Director of the Electronic Retailing Association that oversees over 300 billion dollars in direct response advertising throughout the world. Andrej Skrinjar is a Chairman of the INPEX International Judging Committee. Hailing from Slovenia. Judge Skrinjar along with five judges also sampled the oil.